Reporter: "On August 20, 1975, the first Viking spaceship was launched. Just two weeks later, there was a second Viking launch. Together they began the search for Martian life." Narrator: Two orbiters, two landers, headed for two different locations on the red planet. It was a gutsy mission. "It was one of the biggest adrenaline rushes of mine or anyone's life and the story, as it unfolded, was a classic example of scientific discovery." "NAV is green for touchdown. AGS is green. 1.5 degrees per second max. Point-two g's. 8 feet per second. Touchdown! We have touchdown!" Gentry Lee: "We didn't know then what we know now, which is how tough it really is to land on Mars." "12:50. That is, 35 minutes from now the playback of pictures will start as I understand it." Gentry Lee: "A moment in every Viking's life that he or she will never forget is sitting with that television right in front of you, and watching as the first lines came down line by line by line." "By the time we could see 5 or 6 lines, we could actually start seeing the outline of a rock." "We saw one section-and two sections -- three sections. And we started seeing the surface of Mars. And then you knew we had done it." Gentry Lee: "It's no way to describe it. We were lifted up. It was. Everybody kept walking around. This photograph will be in books a thousand years from now." 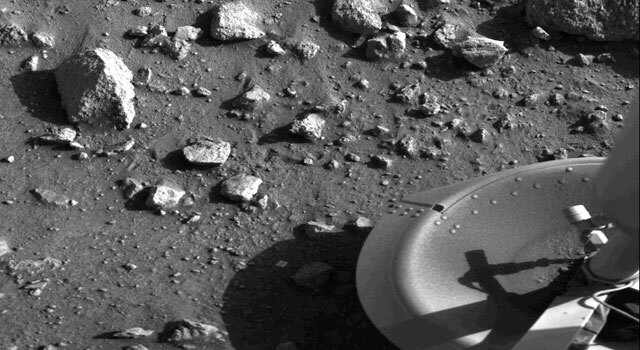 Narrator: Viking gave us the first view of Mars as if we were standing on the surface. It lasted over 6 years, but never did find conclusive evidence for life on the red planet. "After all, that was the whole purpose of the Viking mission, was to go and land on the surface , scoop up some soil and see whether on not this planet had developed life. Well, we're still looking for that life but today we think it's in particular areas. It's not just anywhere on the planet, so we have to be special about where we go to look for it." Narrator: Viking did provide a wealth of data. It mapped the entire planet and charted seasonal changes. People began to see the real Mars. Every time we've gone to Mars, we've increased our ability to see details. And we've seen a brand new Mars. But for a Viking, no picture could ever be more powerful than the first one. Gentry Lee: "Every single time we have gone there, it's been a brand new Mars. But the biggest brand new Mars of all time was in July of 1976."